The best part about being a 2017 nuun ambassador is being able to purchase nuun hydration tablets at a discount. For the remainder of March, nuun has authorized ambassadors to share a special savings with friends and family. Spring is almost here and as the weather warms up, hydration is more important than ever. Stay hydrated with this nuuntastic discount code! 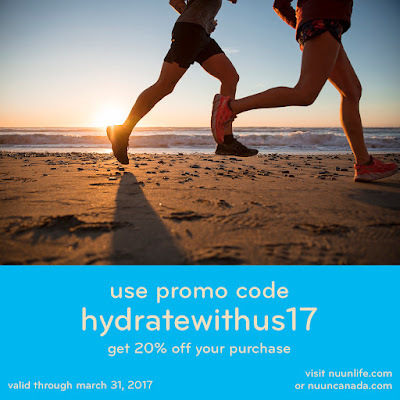 The promo code - hydratewithus17 - is good through the end of the month and will provide 20% off your purchase. It will work for both orders in the USA (nuunlife.com) and for orders in Canada (nuuncanada.com).